Google has released a retooled version of its wildly popular browser-based e-mail client, Gmail, aimed at making the user experience unique for early adopters of Apple's iPad. This eleventh hour addition to iPad should help to quiet the rumored Apple vs. Google war, at least for the moment. 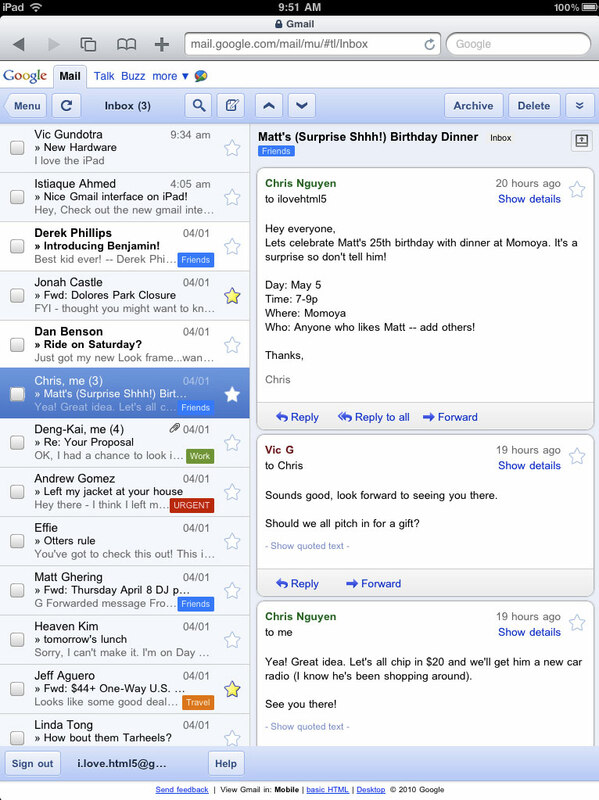 The "experimental user interface" for Gmail is based on the HTML5 Web (HyperText Markup Language) application that was released last year for both iPhone and Android devices. Google has designed a two-pane, iPad-specific view that splits conversations to the left, and active email messages on the right. The newly revised iPad layout was created by Google to optimize use of the 9.7-inch display on Apple's magical and revolutionary device launching in the U.S. on April 3rd. businesses and get directions as well. develop and optimize." Punit Soni wrote.